The closest thing I found was a guitar strumming pattern, it doesn’t seem like anyone has done a definitive uke tutorial. It’s really busy, but if you play it slow, it sounds OK, but still doesn’t feel quite right. Chords for on + off next? I believe that Em7 instead of Em is correct. Thoughts? 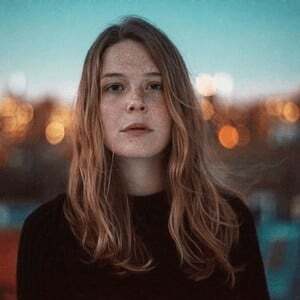 First known for her 2016 viral hit "Alaska," singer/songwriter Maggie Rogers combines folk, dance, and R&B into a powerfully emotional yet crowd-pleasing sound. Growing up in rural Maryland, Rogers began playing harp at age seven and loved the music of Gustav Holst and Vivaldi. Meanwhile, her mother played her neo-soul divas like Erykah Badu and Lauryn Hill; by the time she was in middle school, she'd added piano, guitar, and songwriting to her repertoire.